After dropping as much as 10 cents per bushel in early trading on the Chicago Board of Trade after what appeared to be a bearish U.S. Department of Agriculture harvest report, corn and soybean prices fought back to end the day unchanged. Corn closed the market day down about a half-cent at $6.44 per bushel for December delivery. Soybeans bounced back from negative territory to end the day up 4 cents to $12.39 per bushel. The USDA raised Iowa’s forecast corn yield to 169 bushels per acre for this year’s crop, two bushels per acre more than its previous 2011 estimate and four bushels per acre above the 2010 Iowa yield. The 2011 yield will still fall short of the record 182 bushels per acre set in 2009, and the 171 bushels per acre in 2008 and 2007. Nationally, the corn harvest will be 12.4 billion bushels, nearly identical to last year’s harvest. The national yield is expected to be 148 bushels per acre, down from 153 bushels per acre in 2010 and 164 bushels per acre two years ago. The report left a confusing picture on export demand. The USDA said demand for U.S. corn, soybeans and wheat would drop next year in the face of competition from grains coming from Central Asia. Meanwhile, China reportedly has booked a purchase this week of 1.5 million metric tons of corn (58 million bushels) from either the U.S. or Argentina. Anticipation of such a purchase has helped boost U.S. corn prices from below $6 per bushel last week to a close of $6.54 per bushel overnight Wednesday. The USDA reports that Iowa lost about 450,000 acres of corn this year, primarily to floods on the Missouri River as well as hail and windstorms, plus field fires that struck late last month. The growing season also was hampered by a heat wave that occurred during the pollination season in July. Still, Iowa will harvest 2.3 billion bushels of corn this year, up from 2.15 billion bushels last year as farmers switched more land to corn production. Roger Fray of West-Central Cooperative in Ralston said he had been “pleasantly surprised” at yield figures from farmers so far. About 20 percent of Iowa’s corn has been harvested, he said. Iowa’s soybean yield will be down slightly, to 50.5 bushels per acre from the 51 bushels per acre last year. The total soybean harvest in Iowa this year will be 467 million bushels, down from 496 million bushels last year on about 250,000 fewer acres in the state. Nationally the soybean yield will be down to about 3.1 billion bushels from 3.3 billion last year as about three million acres were shift from soybeans to corn production. 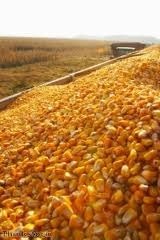 The USDA report said that grain stocks would continue to be tight through 2012, but that greater world supply of corn, wheat and soybeans would lessen demand for U.S. grain. World demand for U.S. corn is expected to drop 50 million bushels, 40 million bushels for soybeans and 50 million bushels for wheat. Tight world supplies, along with drought in Russia and a below-average yield in 2010 for the U.S. corn crop, helped double corn prices from $3.40 per bushel in June, 2010, to more than $7 by early this year. Corn has since dropped to the $6.54 per bushel level as worldwide grain stocks have slowly rebuilt, but demand has remain robust from the U.S. livestock and ethanol producers. The picture of Chinese demand was still unclear Wednesday. Bryce Knorr of Farm Futures Magazine said the USDA report pegged Chinese corn production at 7.16 billion bushels, up 200 million. That was more than a recent U.S. industry tour found. Don Roose of US Commodities noted that the USDA forecast a reduction in corn exports, which he said would likely translate into a drop in corn prices today and this week. The USDA also increased its estimate of worldwide grain stocks, reflecting the reentry of Russia and the Ukraine in world grain markets. “Exports are going to be more competitive than ever,” Roose said. The USDA report confirmed what Iowa cattle producers have reported as the summer went long, that hay production is down in the state. The USDA pegs the Iowa hay crop at 2.48 million tons this year, down from 3 million tons in 2010 as more acres were shifted to corn production.